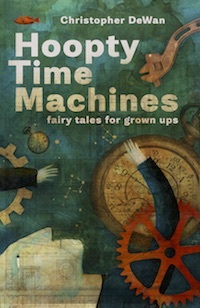 Christopher DeWan's HOOPTY TIME MACHINES: fairy tales for grown ups is a collection of forty-five fantastical stories filled with peculiar journeys and wild awakenings, with fairytale heroines, introspective superheroes, and a whole menagerie of monsters—each one deeply human, and a little bit heartbreaking. Order now. And travel with us through time at Twitter, Facebook, and Goodreads. Cover art by Yevgenia Nayberg.